It’s critically important not to get rusty. The next America’s Cup takes place in Auckland in March 2021, and it will be raced in the foiling AC75 monohull. It’s a brand new class and the rules forbid the launch of any boat before the end of March 2019. So we needed to find something for INEOS Team UK to race in this year. T5, the test boat we created from a Quant 28, is a great tool for understanding how the AC75 will work and funnelling that knowledge into the design of our own America’s Cup boat. But our sailors also have to stay current, sharp and race-ready through the long design and build phase that we are now in. 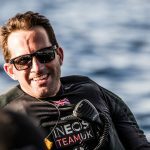 We wanted the sailing team to compete together on an existing racing circuit. Initially we looked at the TP52s, and some of the other America’s Cup teams did choose to race in those boats. But the only real similarity with the AC75 is the fact that they are both monohulls. So we looked around for alternatives. 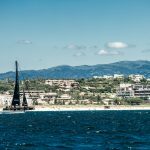 We didn’t want it to cost a fortune either and it seemed that the GC32 foiling catamaran fitted well – a top speed of over 30 knots and relatively simple systems let us concentrate on the racing. The Extreme Sailing Series also uses the GC32 in its Stadium Racing circuit, but while it’s a more commercial series orientated to spectators and sponsors, we felt that the quality of the racing was better on the GC32 Racing Tour. And that had to be the priority: good, competitive sailing in a foiling boat. We still had to learn all the nuances of the boat, though – the right time to try to get it foiling, when to change modes, when to go for the tacks and gybes and the detail of the execution on all those manoeuvres. It’s the same with any crew; there is a lot of teamwork involved and everyone needs practice and a good feel for the boat. We joined the circuit at the second event in Lagos, Portugal. Although we came third at that event it was obvious that we lacked time in the GC32; we were a long way from the level of Franck Cammas and his winning NORAUTO Team France. The expectations are always high, and while we were frustrated not to be performing better, the goal was always about developing the team. To that end, we rotated our sailing squad through all of the events in order to give as many of our squad members as much race time as possible. The fact is that if you want to win in any class you have to do the hours on the water. We progressed massively through the season to the point that we were able to really step up and dominate the final event, in Toulon. That we were able to improve so significantly while rotating our crew was a real success and it feels like we certainly maximised our experience on the GC32 Racing Tour. Being on the tour worked well towards our ultimate goal of winning the America’s Cup. To get this high-quality foiling racing under our belts was invaluable for our campaign. We challenged our sailors but also encouraged the whole team to work together, including our sailing team coach Rob Wilson, sailing team manager Jono Macbeth, fitness coach Ben Williams, the boat maintenance team of Matt Adams and Aston Campion and the wider team back at the Camber in Portsmouth. 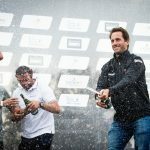 The GC32 Racing Tour did an excellent job of that this year. But next year we will step up to the AC75 – and that will take things to a whole new level.